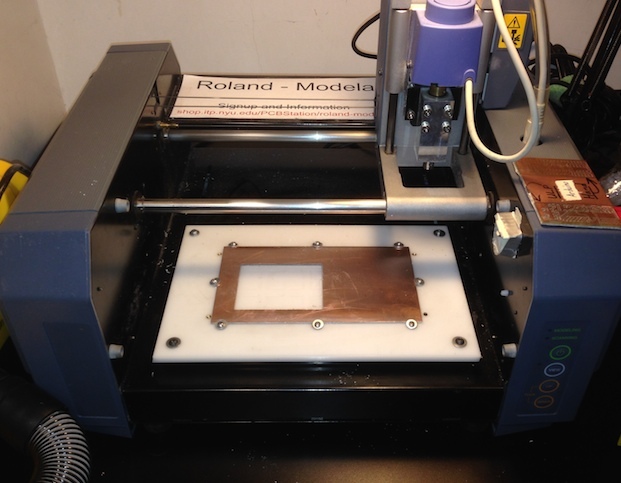 The Roland-Modela is a discontinued, but well made micro-milling machine. 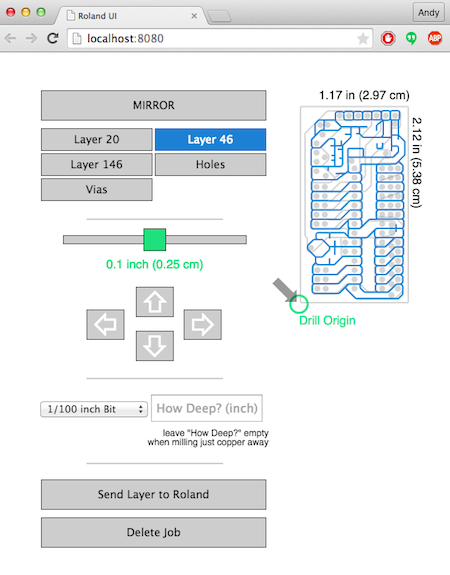 It's software package is terrible, so I made a simple interface for milling PCBs, and designed a new bed from delrin. Download the interface here, and check out the native app for OSX. 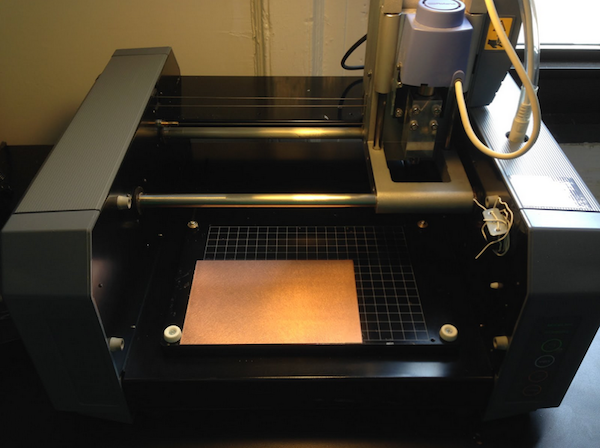 The Roland-Modela is a discontinued micro-milling machine, and students at ITP use it to mill PCBs from copper clad plates. It’s a well made machine, but it’s software package is terrible. We had to edit the executable files manually in text editors, and of course we didn’t know what we were doing. Not to mention, the bed was made from steel, so all copper plates were held down (unevenly) with messy double-sided tape. We were breaking bits like crazy! Below is a screenshot of the interface. It allows you to jog the head around, in order to select your cut’s origin (impossible until recently). It also loads preset speed and plunge values for different bits, so that each bit is used at it’s most optimal settings. To load your file, simply drag the Eagle .brd file onto the interface, and it will parse our all the layers that contain toolpath lines (drawn with WIRES). Then it’s just a matter of selecting the correct layer and bit size before pressing print! The software can be found on GitHub. Check out the README for installation instructions and getting in running. The FAQ for the Roland-Modela and interface can be found on ITP’s shop website. Here is a direct link to the Modela’s page. I have also recorded to video tutorials on using the Modela. The first is on how to prepare your Eagle file to be milled, and the second is a walkthrough of cutting that same file.